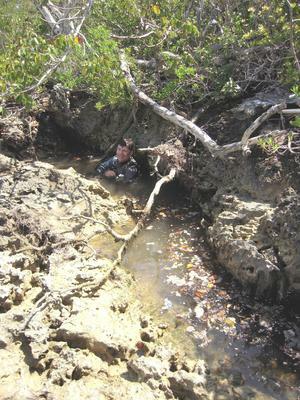 Mr. Amos Weatherford told Nancy Albury and I about this small crack in an area that is soon to be bulldozed for a marina near Angelfish Point on Little Abaco. Once we arrived at the site, Nancy put on a mask and snorkel and slid beneath a foreboding looking poisonwood tree into the water. Amos had told us about raging currents and siphon's associated with this site, but the little bit of water that was in the crack was placid. Nancy snorkeled down into the crevice a few feet and came up with a disappointing report of only one possible place where a side mount diver might get through next to a rock wedged between the two vertical walls of the crack. The stories that Amos had told us about raging currents at the site, meant to me that there was cave down below the restricted crevice. So I decide to kit up with side mounts and give it a go. After dodging the poisonwood tree and sliding into the crack, I tied off the reel above the water line and slid backwards into the crack as far as I could. Just below me I could see the rock that Nancy had reported and tried to fit into the crack on the right hand side of it. After getting fairly stuck, I decided to back out and try the crevice to the left side of the rock. I pulled out some slack on the reel, locked it off and dropped it down through the crack ahead of me. I was able to get my head and shoulders down into the narrow crack, but my chest had snagged fairly hard. I tried exhaling a bit and I was able to gain a few inches, but my left tank had wedged in the crack to my left where it narrowed quite a bit. I hung there for a moment trying to decide whether to try and force my way down or to back out while I could. Once I was able to find a decent push point, I pushed my way back up out of the crack and readjusted my harness and cylinders and let as much air out of the BCD as possible. I inverted once again and got my head and arms though the crack. After moving side to side a bit and exhaling hard, I literally fell through the crack where it widened enough for me to lay sideways to the vertical walls. A rubble filled floor led down to some flow stone formations which choked any further chance of exploration. I could see where the massive currents had smoothed the narrow walls and flow stones down. I spun around in the crevice like a lizard in a crack and headed back to the only narrow gap in the crevice that lead back to the surface. Getting back through the narrow crevice was not as difficult as getting in and I was back on the surface in seconds. A lot of work for not much cave, but we now know where all the water is going to/coming from. Unfortunately, it looks like this site is due to be destroyed by the local developer who has slated the area to be dredged for a marina.